Ezra Klein links to a Slate article by Ben Eidelson that, I think, is quietly devastating to the idea that the Senate filibuster has somehow destroyed the democratic process. Eidelson shows that from 1991 to 2008, in the typical successful filibuster, the senators behind the filibuster (i.e., opposing the cloture motion) represented states comprising 46 percent of the U.S. population. If filibustering Senators represented 51 percent of the population, then we would conclude that the typical successful filibuster was supported by senators representing a majority of Americans. In that case, at least by small-r republican principles, the filibuster would protect the will of the majority. Forty-six percent is not 51 percent, of course. But here’s another way of thinking about the effect of the filibuster. It could be argued that, to account for the fact that most Americans’ views on most issues are only weakly held, we should have a higher threshold for legislation passing than support by a simple majority of senators, or even support by enough senators to represent a simple majority of Americans. Instead, for legislation to pass, we might decide that enough senators representing 55 percent of Americans should support the legislation. If that were the procedural guideline, then on average, the way the filibuster has worked has been consistent with that guideline. For the practice of the filibuster when Republicans have been in the minority to be consistent with a procedural guideline, the rule would have to be that enough senators to represent 60 percent of Americans should support the legislation (see Eidelson’s table). Interestingly, however, despite the greater use of the filibuster among Republicans, in Eidelson’s data Republican minorities had an average of 20 successful filibusters per Congress, compared with 16.6 successful filibusters per Congress by Democratic minorities. That’s a fairly small difference, although the current Congress is not included in these figures. Unlike most progressive bloggers, I remain ambivalent about the filibuster. Eidelson’s data shows that Republican filibusters are much more likely to be anti-majoritarian than Democratic filibusters (even if they are not dramatically anti-majoritarian). He proposes as a compromise, replacing the 60-vote rule for cloture votes with a 55-vote rule, which historically would have eliminated most successful Republican filibusters while retaining most successful Democratic ones. Another compromise that’s consistent with small-r republicanism and small-d democracy that might be more palatable to Republicans would be to implement instead something like a 55-percent-of-the-population rule for cloture votes (while still requiring a majority of senators too). This would set a higher threshold for support than simple majority-senator-rule, would ensure that small-state senators could not thwart the preferences of senators representing a solid majority of Americans, and would not have such dramatically partisan consequences compared with a 55-vote rule (meaning it would have a better chance of being implemented). Everyone should read Matt Yglesias’s post,”How Close Were We, Really?“ which makes a point that I’ve been mulling. The fact that health care reform blew up so quickly after the Brown win implies that whatever consensus had been achieved between the Senate and House, it was significantly incomplete, weak, or both. House liberals apparently were not prepared to pass anything coming out of conference that didn’t reverse the problems they have with the Senate bill. But it’s unclear whether moderate senators or representatives would have stayed on board in that event. If the last week shows nothing else it reveals that a whole lot of members of Congress were decidedly un-excited about supporting anything resembling either chamber’s bill. If this interpretation is right, it implies that many progressives haven’t given enough credit to how far out on the plank many moderates actually went (which isn’t that surprising given howmany of them misread the polls). Pre-Brown, moderates were betting that antagonism toward reform wasn’t so strong that their job — their chance to work on all of their other legislative priorities — was in mortal danger. The Brown win provided new information that clearly affected the calculus (as did the initial freak-out by Massachusetts’s own Barney Frank). Perhaps one big reason why the Obama team (and everyone else) was caught flat-footed after the election was that they were unaware of how much moderates already felt they had stuck their necks out. All this said, I think the consensus that Democrats having second thoughts ought to accept that they have no choice but to vote for the final bill is correct. Actually, I think these Democrats have probably reached that conclusion too. But it’s important to note that that wouldn’t be enough to pass something — if House liberals won’t vote for the Senate bill, it doesn’t matter what moderates do. What progressive bloggers need to do is start working the liberal legislators in the House. Last week, I spent some time looking at the living standards of the middle class, showing that they have improved notably over time and giving evidence that they are better than or comparable to middle-class lifestyles in other industrialized nations. I will be returning to this issue in a later post in order to address the “two-income trap” argument of Elizabeth Warren, which was raised by Reihan Salam and by Rortybomb. For now though, I want to talk about the living standards of the poor. It’s important to make the distinction between trends (which I’ll discuss today) and absolute levels of material well-being (which I’ll discuss in a later post) because things can have improved a lot at the same time that they are still not all that great. Let’s return to the comparison I used in my post on the middle class of “the gold standard” of 1973, when median household income was at its pre-stagflation peak, to 2008. To represent “the poor,” I’ll look at the 20th percentile — the household that is doing better than 20 percent of other households but worse than 80 percent of them. You’ll have to trust me that my research indicates the story would be similar if I were talking about the tenth percentile. It’s easy to look at only a fairly limited income measure going back to 1973 for the 20thpercentile. Doing so indicates that income at the 20th percentile grew from $19,046 to $20,712 (in 2008 dollars, adjusted by the Bureau’s preferred CPI-U-RS). That’s obviously not impressive growth, though it should be noted that the poor are a bit better off today than they were in 1973 (and they look a little better comparing 1973 to 2007, which is a fairer comparison). Using the PCE deflator, which the federal Bureau of Economic Analysis uses (and which I prefer because of the evidence that the CPI-U-RS overstates inflation, particularly among the poor), income increased by about $3,000 after accounting for the cost of living, or 16 percent. That’s about the same as for the middle class using the same measures and methods. As I noted in the middle-class post, the official income definition is pretty limited. The Census Bureau’s “Definition 14″ takes into account taxes, public benefits, and the value of health insurance, and it’s easy to look at going back to 1979 (which was at least as good/bad a year for the poor as 1973 was). By this measure, income at the 20th percentile rose from $17,999 to$24,642 from 1979 to 2008 (using the CPI-U-RS). That’s an increase of over one-third—after adjusting for the cost of living. When the PCE is used to adjust for the cost of living, the increase is almost $8,000—45 percent! A number of commenters to my post on the middle class didn’t like that the value of health benefits were included in my “comprehensive” income measure. I prefer including them in “income” because employer health care costs have caused earnings growth to be quite a bit lower than it otherwise would have been, and employer- and publicly-provided health insurance contribute to living standards. It is possible that the way the Census Bureau estimates the value of health insurance exaggerates improvements in well-being, but it is not simply the case that rapid health care inflation negates those estimates. Many health economists believe that rising health care costs do reflect corresponding improvements in the quality of care received. At any rate, whether or not you believe I have a dog in this fight, hopefully you believe that the Census Bureau doesn’t. Nevertheless, we can look at the trend omitting the value of health insurance in 2008. Doing so offers a somewhat conservative estimate of the increase because I can’t omit the value of insurance from 1979. The increase, however, is 21 percent using the CPI-U-RS, and 29 percent using the PCE. So it seems pretty likely that the living standards of the poor in the U.S. have improved fairly robustly in recent decades. Before leaving behind the question of trends, I should note that there is pretty overwhelming evidence that male workers who don’t get further education beyond high school have seen real wage stagnation (though the story for the median male worker, as I showed in the middle-class posts, is much better). The fact that household incomes at the bottom have grown reflects a decline in taxes paid, an increase in the value of means-tested benefits, and greater work among women (including single women). Computations I have done indicate that confining things to non-elderly households doesn’t affect the story importantly; nor does adjusting incomes for household size. This issue of greater work among women is one of the last remaining arguments to my case that I feel I need to address more, because it is obviously key to the question of whether higher incomes really reflect improved living standards broadly construed. After all, we could all work more hours and sleep less, which would improve our incomes but not necessarily our quality of life. I’ll take this up in my next couple of posts, but suffice it to say, you can assume my read of the evidence doesn’t overturn the case I’ve been trying to make thus far. I spent a chunk of time on the train to New York yesterday reading through bloggers’ reactions to Democrats’ reactions to the Scott Brown victory in Massachusetts. And I’m confused. First, an awful lot of liberal bloggers seem all too eager to advance a pernicious stereotype about the Democratic Party — that it is feckless, weak, wimpy, cowardly, unprincipled, etc. Look, it’s not that every Democrat was scared away from health care reform by the Brown win. As far as we know, very few were. If you want to make accusations of cowardice, aim them at those few specific legislators who have flip-flopped — the rest of the party can’t do much to make them vote in favor of reform. If President Obama didn’t come out as aggressively in favor of passing the Senate bill as you wanted, that’s probably because he knows he doesn’t have the votes and has little interest in self-immolation. By tarring the entire party, you aid and abet Republican efforts to caricature Democrats. And for the love of God, if you feel no longer energized to elect Democrats in November because some congressman in some other state caved, well, you need to take a deep breath and count to 10. Losing health care would be a huge, regrettable defeat, but by sitting out November, you would also make progressives in Congress worth supporting suffer for the sins of others. There will be a mountain of analysis regarding the Brown victory in Massachusetts last night and what it means for health care reform. But what is striking to me this morning, skimming myRSS feeds, is the same thing I have found striking throughout the past year — how willfully ignorant liberal advocates of health care reform continue to be about public opinion on the Senate- and House-passed versions of health care reform. You can argue that people are uninformed. You can argue that Republicans have misled them. You can argue that people support something called “health care reform” as a general concept. But the numbers are what they are — only a minority supports the bills under consideration. Faced with such numbers, reform advocates have defensively pointed out that much of the opposition to health care reform comes from the left, as if that somehow rendered the bills’ unpopularity irrelevant. What is devastating to their case, however, is a look at the intensity of views toward reform. When assessing polling results, I have found it is crucial to employ what I call the Kessler Rule, after Third Way’s Jim Kessler. Jim argues that anytime someone tells a pollster that they are “somewhat” supportive or opposed to something, it basically means they don’t have strong feelings one way or another or that they have so little interest in the issue that they haven’t even formed an opinion. Rasmussen has been asking its respondents whether they “strongly” or “somewhat” support or oppose health care reform for months. The first time they asked was in August, during the congressional recess, when they found that 43 percent of respondents were strongly opposed, compared with 23 percent who were strongly supportive. Keep in mind, this was when the public option was still included in all major proposals, so liberal backlash was unlikely to have been much of a factor in this contrast. The most recent poll Rasmussen conducted was over the weekend. Results: 44 percent strongly opposed, 18 percent strongly supportive. You would think that such numbers would dent the confidence of reform advocates that the public overwhelmingly supported their own preferences. You would be wrong. Instead, incredibly, health care reform was cited throughout the fall and winter as Exhibit A for why we need to get rid of the filibuster in the Senate! If something as popular as health care reform faced such difficulty winning passage, it was argued, then the Senate can no longer govern! Now with Scott Brown’s defeat of Martha Coakley, advocates have bent over backwards making the case that the election of a conservative in one of the most liberal states in the country — to fill a seat vacated by the patron saint of health care reform, at a time when the result would determine the fate of reform — had nothing to do with public opposition to reform. Rasmussen’s election night survey says everything you need to know about how much these advocates are kidding themselves: 78 percent of Brown voters strongly oppose the health care bills before Congress. What’s my point? It’s not that the case for health care reform is bunk or that policymakers should make their decisions based on polls. Like many progressives, I think the House should pass the Senate bill and that they should fix it later. (Unlike most progressives, my “fixes” would involve moving in the direction of Wyden-Bennett or even a more generous version of the House Republican bill rather than in the direction of House Democrats.) It’s not that liberal advocates should not spin issues in ways that promote their policy preferences. It’s that they should not believe their own spin — the country remains moderate. But don’t take it from me — take it from the 2010 electorate in November. Kevin has always been one of my favorite bloggers, but I have to disagree with him here—both in terms of the level of income the typical American has and in terms of recent trends, a careful look at the data implies that the middle class is doing pretty well. The common belief among progressives that this isn’t the case causes us to misdiagnose what the nation’s most pressing economic problems are and to put forth an agenda that doesn’t resonate as strongly as we think it does. My friend Steve Rose really deserves the most credit for trying to draw attention to the reality of middle-class living standards being better than the left believes. In a much-circulated report for PPI and in his analyses for Third Way, Steve showed that, for instance, when measured correctly, the typical working-age American’s income is much higher than official statistics imply. Many progressives thought that Steve was somehow pulling a fast one, a view with which I strongly disagree, but let me make similar points in a more transparent way here. 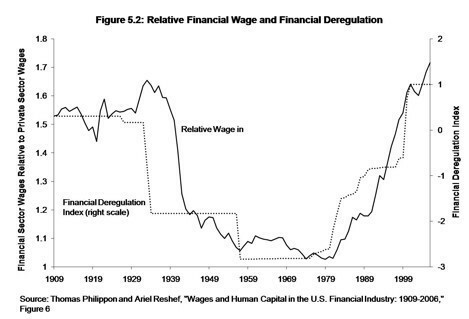 First, consider what many progressives consider “the good old days”—the height of the pre-1970s economic boom. In 1973, the median inflation-adjusted income was higher than it had ever been and higher than it would be again until 1978—$45,533 (in 2008 dollars). Call this the gold standard before, in the conventional progressive telling, things started going south. How much did things go south? Well, in 2008 the median was $50,303. That’s right—about $5,000 higher (after adjusting for changes in the cost of living). This improvement understates things because households also became smaller over time, and because the inflation-adjustment here probably overstates inflation. For instance, if one uses the Bureau of Economic Analysis’s Personal Consumption Expenditures deflator, the increase from 1973 to 2008 was about $7,700, or 18 percent. Not only does that still not adjust for declining household size, it also doesn’t include changes in taxes, non-cash benefits, the value of health insurance, and capital gains. Incorporating these adjustments shows an increase in living standards that is more like 40 percent. Rather than household income, others on the left point to stagnation in men’s wages (women’s wages have increased dramatically by any measure). For example, the Economic Policy Institute estimates that the median male worker’s hourly wage was $16.88 in 1973 and $16.85 in 2007. However, EPI’s figures show that when fringe benefits are taken into account, the median male worker’s hourly compensation increased by somewhere between 5 and 10 percent over this period. And these estimates don’t use the PCE deflator. Nor do they account for changes in taxation and public benefits—the very means we use to mitigate low income. To review, “stagnation” of household income or male wages means that after adjusting them for the rising cost of living, they are as high as they were in the glory days of the 1960s and early 1970s–they have actually increased. When analysts on the left concede these increases, they then move the goal posts and argue that wages have not grown as much as they should have. Typically, they contrast modest wage growth with more rapid productivity growth. But too often these analyses are done on an apples-to-oranges basis. Critics left, right, and center have all pointed out flaws with the kind of comparisons that EPI and others make. Careful analyses reduce the gap between productivity growth and wage and income growth, though they don’t necessarily eliminate it. At any rate, economic theory says that compensation will increase with productivity all else being equal, and all else has not remained static. It is certainly true that wage growth has been slower since 1973 than in the two previous decades. But that isn’t a realistic bar to use. The U.S. was the only major economy left standing after World War II, and there was little foreign competition putting downward pressure on manufacturing wages and jobs. The period between WWII and 1973 was anomalous—it could not have been expected to have lasted. The other way to judge middle-class living standards in the U.S. is to compare them to those in other countries. The Luxembourg Income Study shows that at most points in the income distribution (the 25th percentile, the median, the 75th percentile), income in the U.S. exceeds that in nearly all European countries, including Sweden, the model for many on the left. (The most accessible evidence on this is in a 2002 article in the journal Daedalus by Christopher Jencks.) Determining how to incorporate publicly provided benefits such as education and health care is very complicated, but the evidence we have indicates that American middle-class living standards are at worst comparable to those in European nations. Trying to persuade the middle class that it is worse off than it is potentially has harmful side effects. For one, as economist Benjamin Friedman and sociologist William Julius Wilson have argued, people are more generous when they feel they are doing well. When they feel economically threatened, they are more inclined to protect what they have than to help others. What’s more, widespread economic malaise can be a self-fulfilling prophecy, preventing people from making the individual choices that ensure, for instance, a strong recovery from recession. In terms of policy, the belief that the middle class is doing poorly can lead to scarce public resources being diverted to those doing relatively well rather than being used to help those truly in need. And politically, it can lead to a tone-deaf and unpersuasive populism that does little to help Democrats win in swing districts and close elections. Again, the point here is that progressives should care about the facts. Up next…the poor.